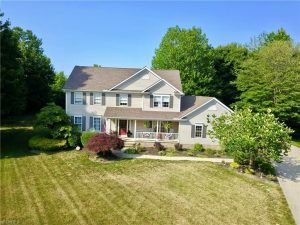 This Beautiful well cared for 4 bedroom, 3.5 bath modern Colonial home, located on a private quiet “Cul de sac” with a large private backyard with a concrete paver firepit & tiered deck makes you feel like your in the country with the private wooded views. Come in the front door to a spacious foyer that will lead you to a formal living room. Just a few steps away is the eat-in kitchen with large island, new granite countertops, backsplash. The kitchen opens to another large living room with fireplace. For even more space for those holiday or family gatherings is a formal dining room. Second level features 4 bedrooms with a huge master suite and master bath. The other 3 bedrooms are very spacious and there is also another full bath. You will fall in love with the full finished basement. Its a entertainers dream featuring a bar, recreational area for pool table, games, area for watching those sporting events and a full bath. Their are so many other features: 3 car attached garage, Invisible fence, 1st floor laundry room, front porch, home warranty is being offered by the seller and so much more. Don’t miss out on this home! !